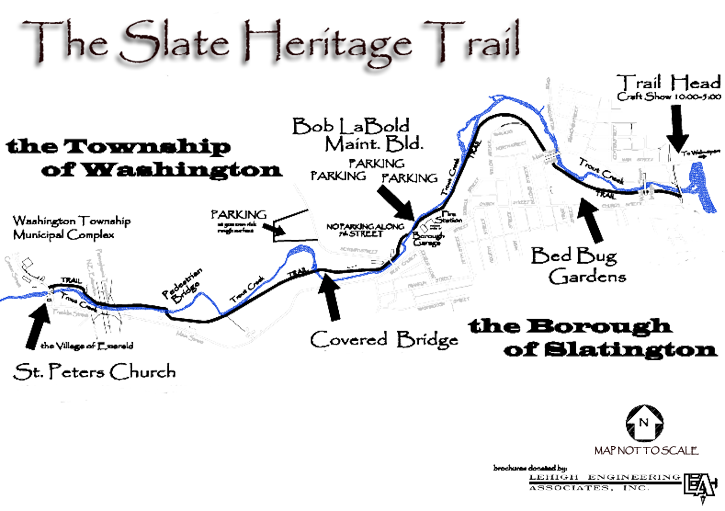 What is The Slate Heritage Trail? The Slate Heritage Trail, a 3.3 mile "Rails-to-Trails" project, utilizes the former Lehigh Valley Railroad right-of-way from a junction with the Delaware and Lehigh National Heritage Corridor Trail (D&L) in Slatington. From the Trailhead the Slate Heritage Trail continues through Washington Township, Emerald, and ends in Slatedale, at the Citizens Fire Company athletic fields. The Trailhead in lower Slatington provides parking and access to The Slate Heritage Trail as well as the Delaware and Lehigh National Heritage Corridor. The D&L Trail connects the Slatington Trailhead to the Laurys Station Trailhead to the South, and the Lehigh Gap Nature Center Trailhead, which intersects with the Appalachian Trail, to the North. Trail patrons will utilize a total of Four Bridges while on The Slate Heritage Trail. There is an original Trestle Bridge that was restored, two prefabricated Pedestrian Bridges that were placed by dedicated volunteers, and the Trout Run Covered Bridge that was built from the ground up and dedicated in 2004. The Gathering is held annually on the first Saturday in October. The main festivities can be found at The Trout Run Covered Bridge. We ask that all pets are leashed and that their owners respectfully clean up after them.